Save approximately $1,600 over one-on-one ground instruction with your flight instructor. This a great opportunity to save money on ground training while learning about flying in a structured, classroom environment. Includes a $50 nonrefundable administrative fee. To register for ground school please first pay for the course using the PayPal Buy Now button. After paying for the course you will be directed to fill out a registration form. Registration will not be accepted without payment. Alternatively, call us at (860) 724-2245 or come into the office during our normal business hours to signup. In order to obtain the Private Pilot Certificate, Instrument Rating or Commercial Certificate a written exam must be taken and passed with a 70% grade or better. 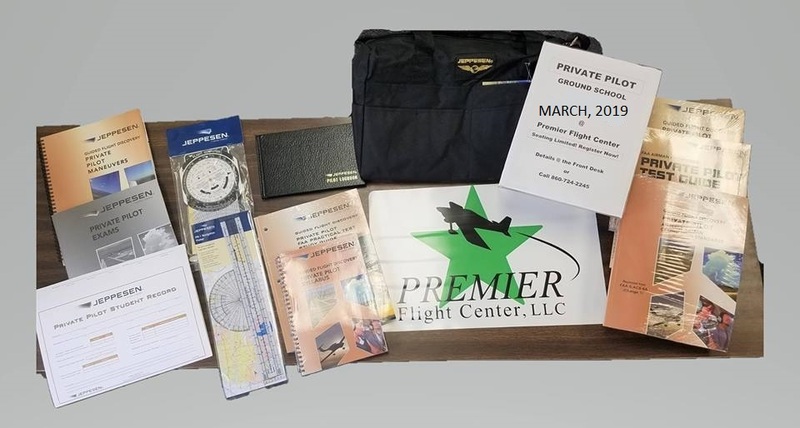 Premier Flight Center offers the option of a classroom type setting for our ground schools, which prepares each student for the FAA Written Exam. Our syllabus uses the building block theory of learning, which incorporate a variety of learning methods (Lecture, Overheads, Demonstration and Home Study Work). After a successful completion of our ground school, each student will be given the “sign-off” (aka: permission slip) to take the FAA’s written exam. The materials needed for our ground schools are the Jeppesen Part 141 Kit which our syllabus is based on.